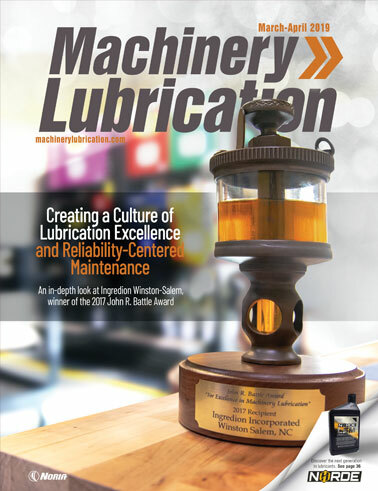 Proper lubrication is essential to maintaining the life of your equipment. Grease guns and grease fittings are widely used in today’s industry and offer a simple means to lubricate machinery. The origin of this innovation goes back to the early 1900s. Arthur Gulborg was a son of a co-owner of a small die-casting plant in Chicago. His job was to relubricate the die casting machines by refilling their oil cups several times a day. This labor-intensive task led him to invent the grease gun (screw type) and grease fitting in 1916. He invented the fitting, a braided metal hose having a special end connection, and screw-type grease gun. Arthur Gulborg and his father named it “The Alemite High-Pressure Lubricating System” after the Alemite Die Casting and Manufacturing Company where the idea was first formed. In 1918, the Gulborgs approached the U.S. Army with this invention. Several test installations were made on white trucks in army service. Gulborg’s invention vastly simplified the task of lubricating army trucks. On July 10 of that year, it became standard equipment. By 1922, Alemite introduced the “Button-Head” system to serve on a more rugged, heavy-duty lubricating system for many industrial applications. The “Junior Button-Head” system was used to lubricate motorcycles and “Standard” and “Giant” versions of the button-heads were used in a wide range of industry including heavy construction equipment. The automobile industry, however, was the greatest immediate potential for sales. Within five years of Gulborg’s patent, the passenger car became equipped with an Alemite hand grease gun and hose assembly. Grease guns became familiar to the general public, and most automobile lubrication was performed by the car owners. 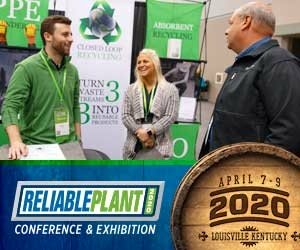 In 1924, the Allyne-Zerk Company of Cleveland, Ohio was purchased by Alemite, and the Zerk line of lubrication fittings and hand grease guns was added to the Alemite line. The Zerk design, named after Oscar Zerk, used a fitting much smaller than the Alemite pin-type and did not lock the hose coupler or hand gun and fitting together. Instead, the seal between them was maintained by the pressure of a pushing action when the operator applied the coupler to the fitting. This became known as a push-type system. In 1930, Alemite introduced new hydraulic fittings. Today’s hydraulic fittings are very similar to the original version and remain the most popular grease application system in the world. Today, several technologies exist for regreasing machine components. A grease gun is one of the most common. 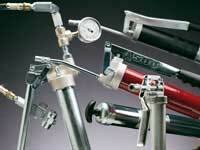 Without proper training, however, the use of a grease gun can lead to over- or underlubrication. There is also a higher risk of contamination if great care is not taken when applying grease with a grease gun. However, with proper training, grease guns are easy to use, allow the technician to inspect the equipment during lubrication, and are relatively inexpensive. 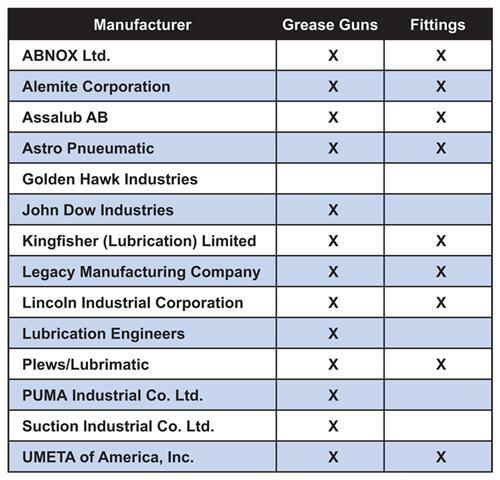 A number of different manufacturers offer grease guns (see Table 1 and contact information), and grease guns are manufactured for a number of different applications. The most common styles of grease guns include the lever, pistol-grip, hand-grip, air-powered and battery-powered styles. The lever style is the most widely used. 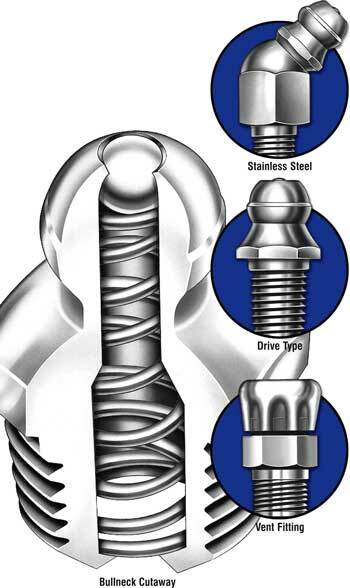 Most manufacturers will indicate the maximum pressure and strokes-per-ounce. One problem with grease guns is that the strokes-per-ounce vary from one manufacturer to the next. Because this is not consistent, it is important to know how much grease the gun delivers to avoid under- or overlubrication. Another important factor to consider is that high-pressure grease guns can deliver grease at pressures greater than 10,000 psi, however most bearing lip seals are unable to withstand more than 500 psi. Also consider where grease is needed. Some points are easier to reach with a pistol or hand-grip grease gun rather than a lever type. The proper grease fitting to use is another important consideration. To prevent dirt and other contaminants from entering, most fittings have a ball check in the head. This also provides a connection between the fitting and the coupler of the grease gun. There are a number of different fittings available from grease suppliers to meet specific needs. Fitting styles come in different angles and lengths to make it easier to lubricate. Marine and some industrial applications may require stainless steel fittings that are non-corrosive and rust-proof. There are some fittings that shut off at specified pressures to prevent overlubrication and blowing out seals. In some instances, like on revolving bearings, protruding fittings cannot be used; fittings that are flush with the surface are available for these situations. If a standard size or style is not available, some manufacturers will allow customization of desired size or style. Morgan, Stan. 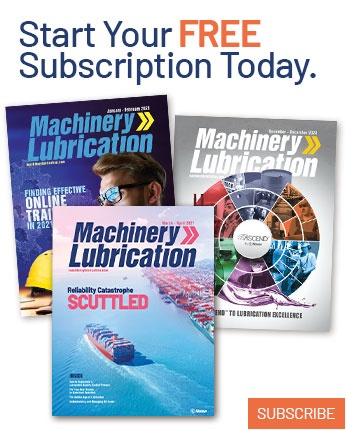 “Grease Guns - Learning the Basics.” Machinery Lubrication magazine, March 2002. “Pathway to Progress, the Alemite Story” Stewart-Warner Corporation. Chicago, 1965.